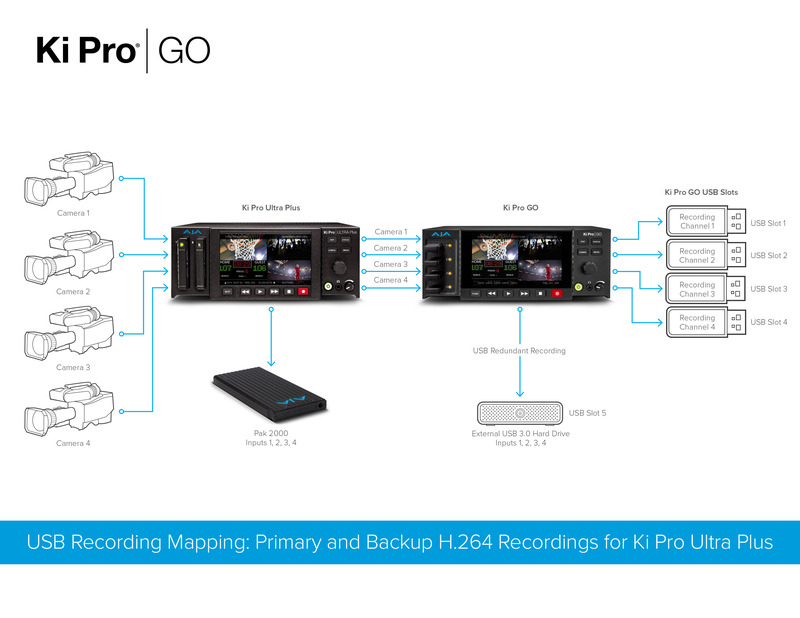 Ki Pro GO is a portable multi-channel H.264 recorder and player offering up to 4-channels of simultaneous HD and SD recording to off the shelf USB drives with redundant recording capabilities. Designed to be either portable or rackmountable with half rack wide, 2RU high dimensions, Ki Pro GO is well suited for use in any environment. Record 1, 2, 3 or 4-channels of HD or SD up to 1080p 50/60 in H.264 simultaneously with Ki Pro Ultra GO. Simplify your setup by connecting up to four HDMI and four 3G-SDI source cables into Ki Pro GO and assign any combination of four inputs at a time for four channels of H.264 recording to the four USB slots on the front of Ki Pro GO. Time is always tight, especially for live events. Ki Pro GO's Genlock free inputs make it is easy to switch your sources including SDI cameras, DSLRs, or HDMI cameras to the appropriate recording channel, all conveniently mapped within Ki Pro GO's elegant UI. Pick your Quality. Deliver your Bit Rate. Low: Suitable for talking heads, conference backups, security backups and more. Medium: Ideal for higher detail and more complex content. High: Serves well for fast moving, highly detailed content like sports or live event scenarios like concerts. 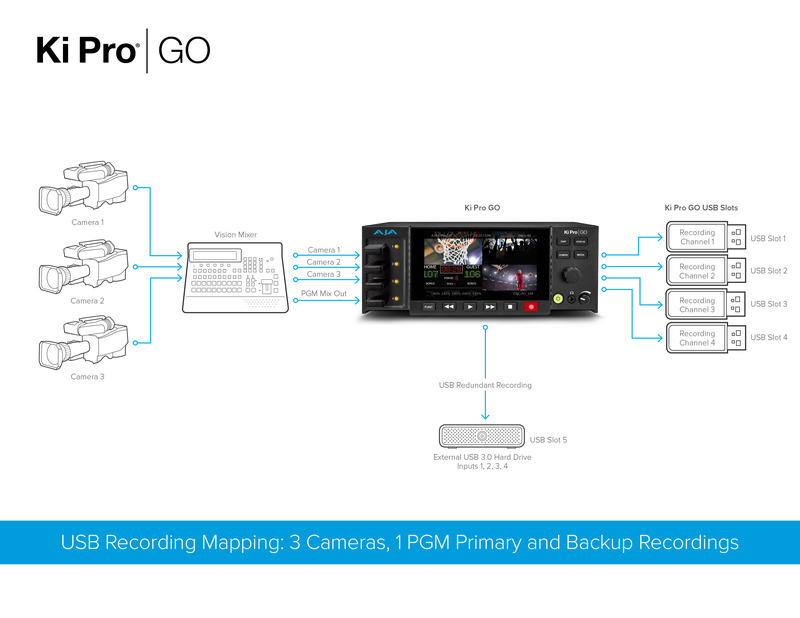 Ki Pro GO offers .MP4 and .MOV for your codec container, providing convenient flexibility for your workflow path. Ki Pro GO offers a large matrix of possibilities for redundant recording needs. Ki Pro GO further allows any combination of recording channels to be sent directly to a particular port of choice. The workflows below provide some examples of just some of the possibilities possible with Ki Pro GO's focus on a key concept of ‘pass out’ or ‘pass around’ or ‘handout’ media. Hit stop on your recordings and the show is ready to give to your clients right there and then. Connect four cameras directly to Ki Pro GO and capture the recording channels discretely to USB sticks in each of the four front of unit USB slots as well as a combination of all four recording channels to a single USB drive connected to the fifth USB port on the rear of the unit. Connect three cameras directly to a vision mixer and then run the camera ISO feeds as well as the Line Cut/Program Feed from the vision mixer to Ki Pro GO. Capture all four of the recording channels directly to USB sticks in each of the four front of unit USB slots, as well as a combination of all four recording channels to a single USB drive connected to the fifth USB port on the rear of the unit. For the best of all worlds for multi-camera shoots, connect four cameras directly to Ki Pro Ultra Plus for high quality Apple ProRes capture to AJA Pak Media. 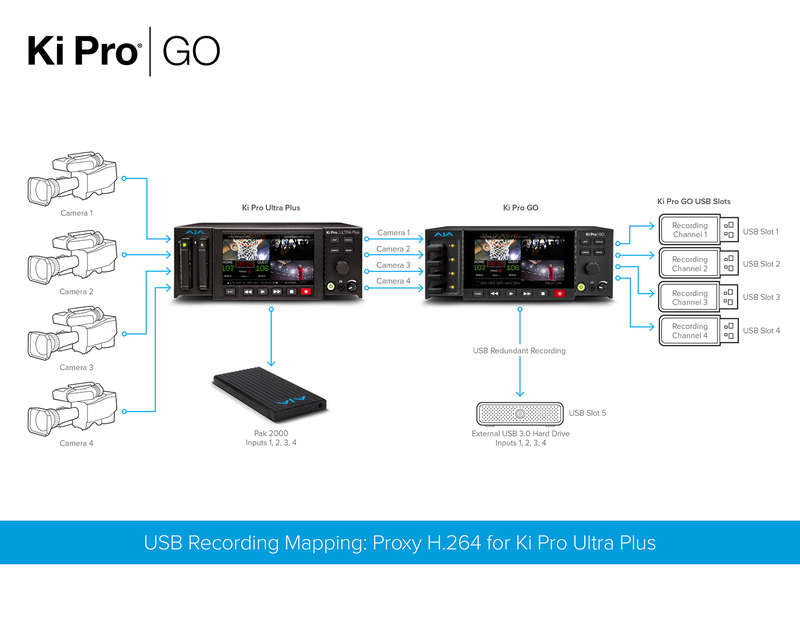 Continue the path from Ki Pro Ultra Plus' four 3G-SDI outputs directly to a Ki Pro GO for H.264 Primary and Backup recording. Multiple recordings, discrete camera capture to ProRes and H.264, with redundancy, all in real time. Multi-camera shoots requiring proxy workflows from Ki Pro Ultra Plus Apple ProRes recordings can benefit from multi-channel capture and redundant recordings of H.264 files on Ki Pro GO at different compression settings, providing redundancy and small file sizes for proxy editing and postproduction. 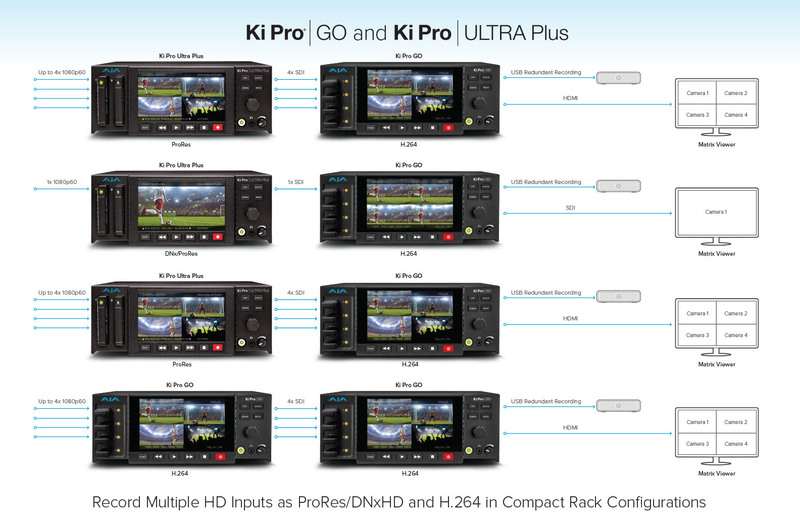 The video and audio connections on the rear panel of the Ki Pro Ultra GO offers 4x 3G-SDI and 4x HDMI inputs with separate SDI and HDMI monitoring which includes Matrix Monitoring for multi-channel viewing on a single HD display. XLR Analog Audio in offers Mic, Line and Phantom Power for audio recording from master sources, mixers and more. HDMI and SDI 2-channel embedded audio or the XLR analog inputs can be easily assigned to each recording channel. Four USB ports on the front provide easy to access recording media using off the shelf USB drives, with a fifth USB port on the rear. Each USB can be configured for redundant recording of all channels simultaneously, either for backup or pass on of a secondary copy of captured files to postproduction, clients, or others on your team. Additionally, any combination of recording channels can be assigned to any individual USB port for maximum flexibility. Four 3G-SDI outputs ensure that signal pass through is available for connectivity into a wide range of devices from routers, to switchers, additional Ki Pros and more. Redundant power supplies ensure that always up reliability is provided for your critical live event needs. 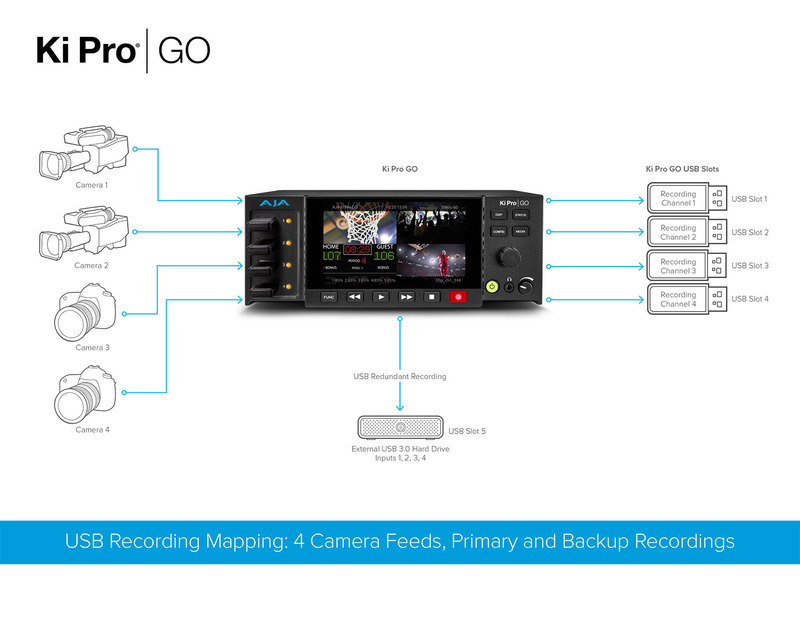 Multi-Channel recording with Ki Pro Ultra GO provides individual, discrete recordings for each input that are timecode accurate and ready to be imported directly into a multi-channel editing sequence. No additional conversion or software is required, just drag and drop the files directly from the USB drive into your edit software of choice. Clip names for Ki Pro GO are laid out in a logical manner for easy data management and tuned for multi-channel editing. Ki Pro GO automatically appends channel and backup naming for easy data management." HD HDMI and/or SDI monitors can be fed from Ki Pro GO's SDI and HDMI monitoring ports to display up to four channels of video in a matrix at a time per display or alternatively you can choose to send a full screen single channel of your choice to either output, allowing both matrix viewing and close up detail inspection for a channel of your choice. This flexibility ensures multi-camera shoots can be monitored on a single monitor when desired, with no matrix converter or independent monitors required for the utmost in efficiency and convenience. Ki Pro GO provides convenient recording to cost effective, off the shelf USB media with FAT file systems support for cross platform use when transferring files to workstations, servers and more. Ki Pro GO features a beautiful high resolution large HD display with Video Monitor and Menu/Status Overlays for pristine monitoring of your material and serves as your interface to Ki Pro GO's familiar and intuitive menu system. The detailed overlay UI includes onscreen keyboard functionality and a clear view of the powerful yet simple to operate UI, all pristinely presented on the HD LCD display. Just like a traditional tape deck, Ki Pro GO features straightforward and dedicated transport buttons - record, play, stop, rewind, fast forward - making the device easy to operate with minimal training time. For the ultimate in professional Multi-Channel recording, combine your new Ki Pro GO with Ki Pro Ultra Plus and capture multiple streams, up to four per device, of Apple ProRes and H.264 in any combination that suits your needs, in only 2RU of rack space. Ki Pro GO and Ki Pro Ultra Plus offer half rack width and 2RU height for convenient pairings in fly packs, equipment racks, OB trucks, and facility environments. Each Ki Pro GO recording channel can capture 2-channels of embedded audio from 3G-SDI or HDMI inputs, or 2-channel Analog Audio from the XLR ports on the rear of the unit. Each XLR port provides a selection of Line, Mic, or +48V Phantom Power for level control and each recording channel offers the choice of Follow Video or Analog Audio. This flexibility enables the capture of audio coming straight from the source input or the capture and insertion of audio from an audio mixer or microphone as desired. In a truck or a machine room, Ki Pro GO is equipped for advanced remote control and configuration. With a standard Ethernet LAN connection to a host computer and any web browser on any OS, all Ki Pro GO parameter settings, clip selection, and transport controls can be controlled; no additional or special software installation is required on the host computer.